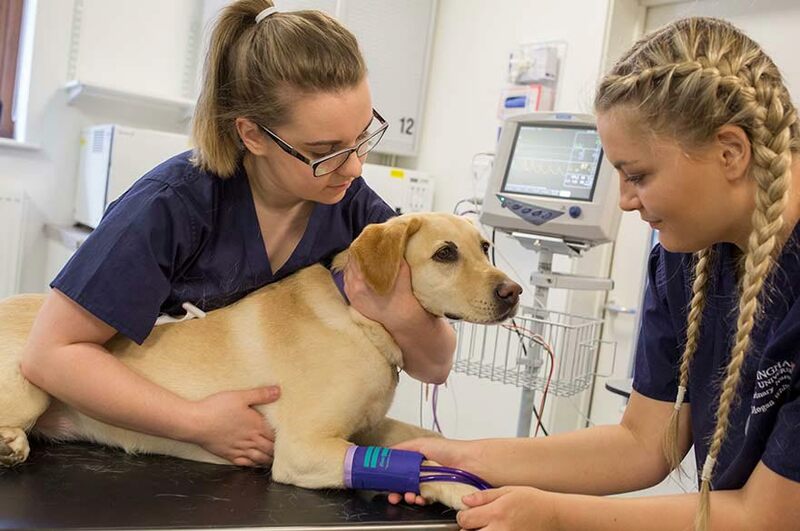 At Nottingham Trent University (NTU), our Veterinary Nursing Centre gives our FdSc Veterinary Nursing students the perfect opportunity to apply their learning in a real-world scenario, providing invaluable experience that enables them to enjoy an excellent start to their veterinary careers. Based at our idyllic Brackenhurst Campus our Veterinary Nursing Centre works in conjunction with our Animal Unit to provide veterinary nursing students plenty of hands-on experience with a diverse range of small and companion animals - as well as larger species such as horses and goats. Our Veterinary Nursing Centre houses a simulated practice, which allows you to gain practical experience in a safe environment. You can train on a variety of equipment such as multi-parameter patient monitor, endoscope, ECG machine, simulation x-ray machines. 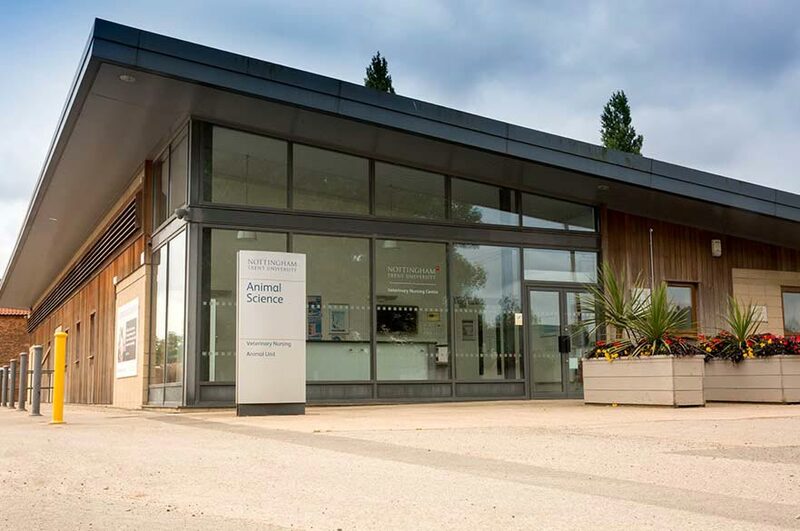 a reception where you’ll be assessed on providing clients with relevant information on recommended animal feed, worming and flea treatment along with issuing over the counter medication. a dispensary where you can practice calculating dosage rates and dispensing drugs for patients. a consultation room with a fully equipped room for pet clinics and client interaction where you can practice major aspects of the veterinary nursing role, such as discharging animals from surgery care and giving owners advice on the general husbandry and welfare of their pets. Support in this training environment is provided by visiting professionals. X-ray machines and Tin Canis dog-skeleton models which allow you to practice positioning dogs and other animals for X-rays. a laboratory including microscopes and diagnostic tests that help identify abnormal parameters.There is also a selection of other industry standard surgery equipment. a hospital with kennel facilities which allow you to learn the different cleaning and setup techniques required for the array of species and diseases seen in veterinary practice. a full surgery preparation area which includes ECG monitoring, drug administration, instrument preparation, and two fully functioning anaesthetic machines. a theatre where you will be taught surgical scrub techniques and aseptic instrument trolley set up. You will also learn how to handle instruments correctly and assist the veterinary surgeon with specific operations and procedures. As part of your FdSc Veterinary Nursing course you will complete a placement with one of our 33 associated veterinary training practices. We're very proud of our partnerships with a range of veterinary practices. 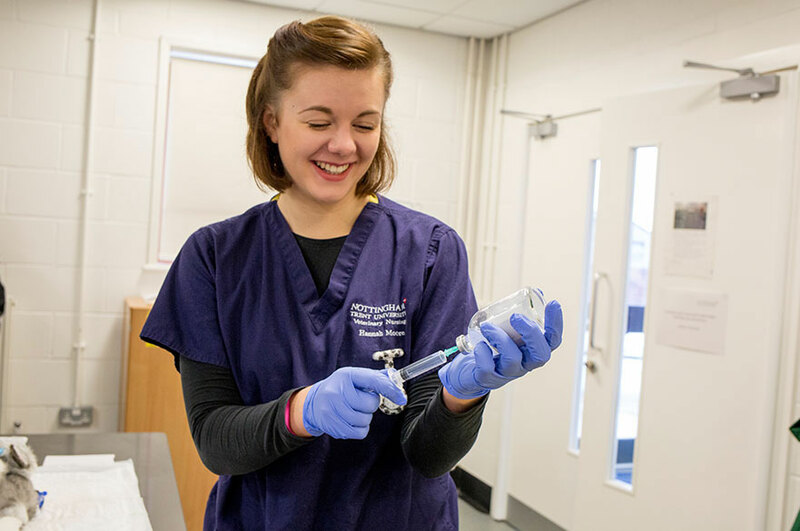 As a FdSc Veterinary Nursing student you'll spend 2,000 hours of the three year FdSc Veterinary Nursing course in Royal College of Veterinary Surgeons (RCVS) approved training practices. This allows you to gain the day one competencies and skills expected of you as a veterinary nurse. While in placement you'll complete an online skills log. This has to be completed in full for you to complete the FdSc Veterinary Nursing degree. 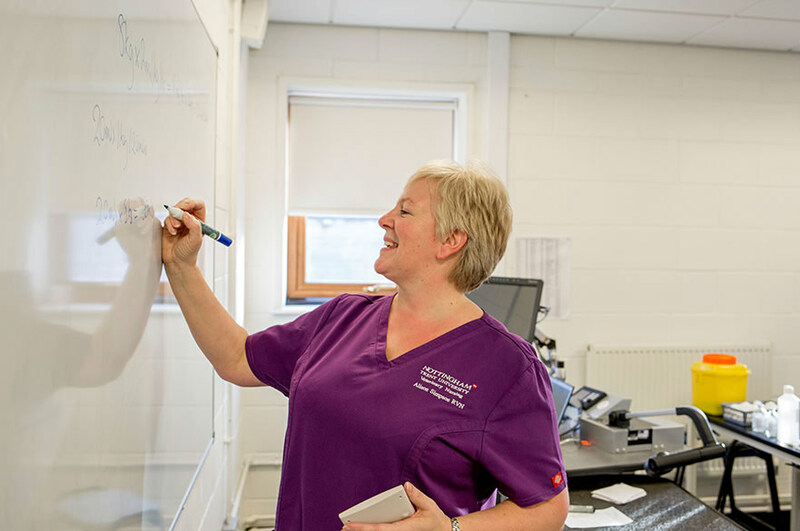 Staff within the School work closely with the veterinary practices to ensure that contact is maintained both with students and the clinical coach in the practice. 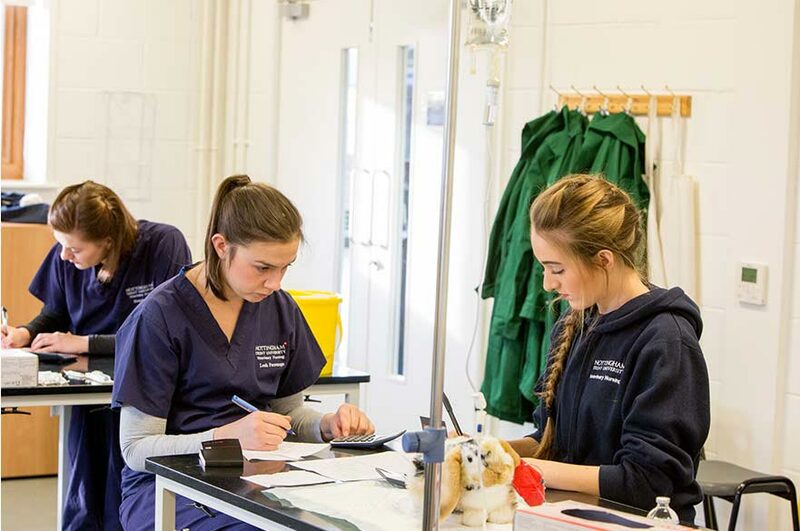 Students are integrated into the normal working rota and have the opportunity to join in all the day to day activities, giving a full and varied experience of the Veterinary Nursing working environment. 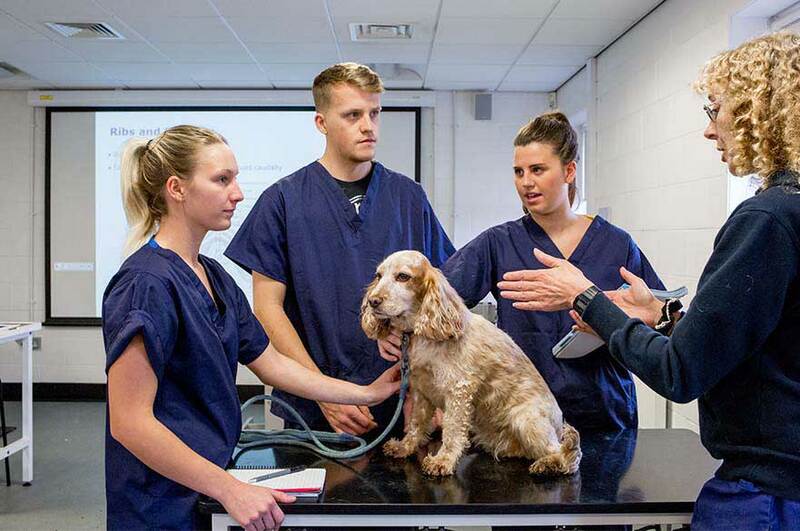 Currently we have 33 training practices under our Veterinary Nursing Approved Centre (VNAC) and a further 40 practices that take our FdSc Veterinary Nursing students throughout the UK.